I was fortunate to be flying between MAN and LHR yesterday (1 April), the day BA introduced its Club Europe service to domestic flights. If I remember correctly, LHR-MAN is BA's shortest sector with flight times of just over 30 minutes - on the return it is not unusual to have a flight time even shorter than 30 minutes. MAN flights fall under the new 'Short' band, and along with LBA and JER it is further subclassified as an 'express' sector (that is a flight with a service time of under 22 minutes). I'm a regular on this route, the vast majority of my trips begin and end at MAN, and I was a little apprehensive about what we should expect on this route and how the heck they would actually provide a Club Europe service in the time available. My mid-morning flight was to be a 'brunch' service. When checking-in I noticed that there were 12 rows of CE on this A320 flight, with just 3 empty seats near the rear of the 'cabin'. I was in 1A and had a great view of what was going on in the galley. We had a 15 minute ground delay (due to a busy LHR) which afforded the CSM time to brief the other crew member on how they would run the service. They also took the time to remove the plastic covers from the meals. The CSM counted the meals, there were 24 cold plates, and 16 hot sandwiches. The CSM was a little taken aback - "how many passengers are there?" she asked her colleague. "43" was the reply. 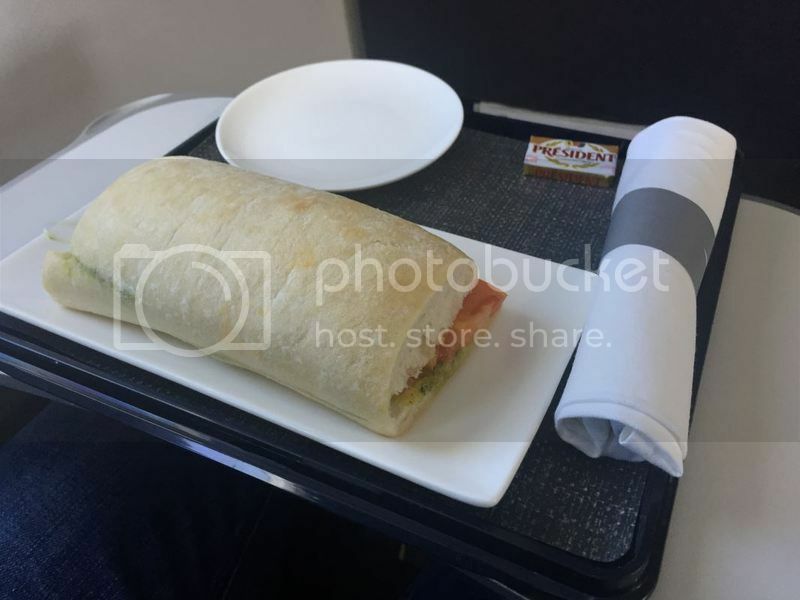 The flight appeared under catered. Those of you who have flown on MAN flights will know that within seconds of takeoff the crew are usually on their feet getting the carts ready for service. Unusually we were at 3000+ ft before the crew were on their feet, and then it was a good few minutes before they started the service. Option 1: Hot sandwich - (a ciabatta with mozzarella and tomato) although on this MAN-LHR flight it was served with a dessert pot. Option 2: Selection of continental cold meats and cheese - this option did not have the dessert pot. After about 3 or 4 minutes of service, a third cabin crew member appeared. It was decided that instead of carrying the plates to the passengers they would now serve from the trolley. Two crew served the meals whilst the third began the drinks service. The drinks service was very slow to start, 1C had completely finished his sandwich and dessert by the time he was offered a drink. I on the other hand waited for my drink to arrive before 'digging in'. 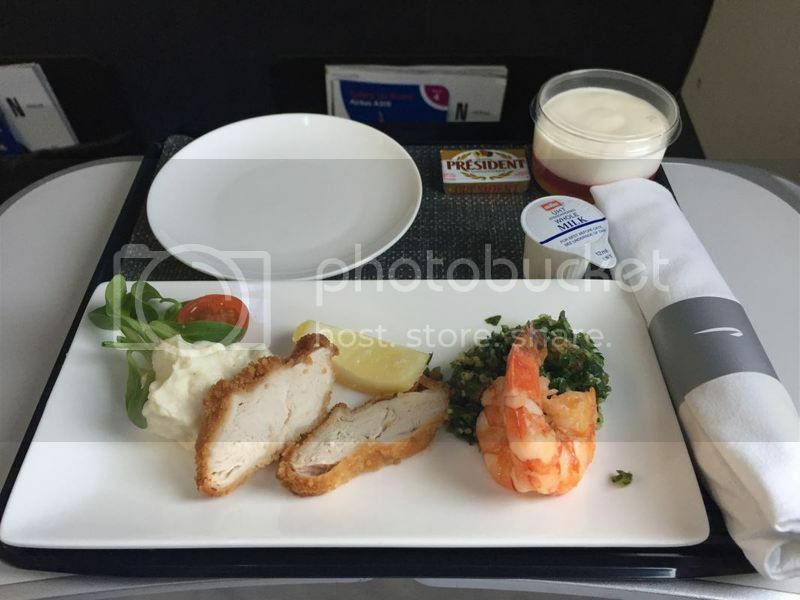 The passenger in 2F asked to have both meal options but he was politely refused. 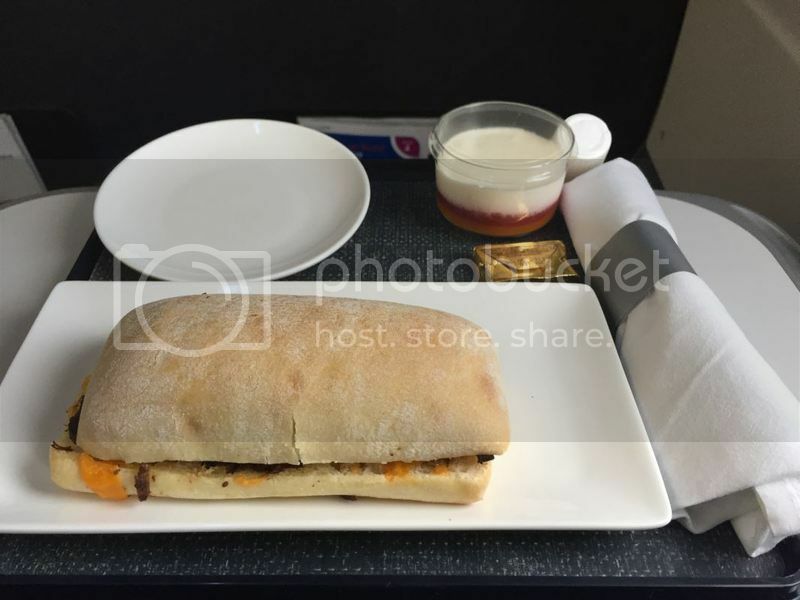 The sandwich (ciabatta) is rather substantial, especially as a mid-morning snack.Even so, the sandwich was popular and not one of the 16 passengers who chose the sandwich left any of it on their plates when the service items were collected prior to landing. The chap sat in 1C wolfed his down and clearly enjoyed it judging by the comments he made to the crew. The ciabatta was served whole, personally I'd prefer it to be served cut in half - careful what you wish for! I decided to go for the selection of continental cold meats and cheese, I found it tasty and really rather nice. It was just the right amount for this very short flight. As this was my first ever CE service on a domestic flight, I had to have the champagne and this paired very well with the dish. The bread basket was offered to all passengers. No drink refills were offered, but to test the service I asked the CSM for a diet coke whilst the main service was still ongoing toward the rear of the cabin. The CSM asked the crew member to serve me when they were taking the drinks trolley back to the galley (so a wait of a couple of minutes or so). On this flight the crew struggled a little, they certainly earned their money. There was simply insufficient crew to serve the 43 passengers on such a short sector. Had we not had to do the usual holding patterns waiting to join Heathrow approach (the flight time was 46 minutes), I am not convinced they would have completed the service. Whilst those of us in the front were served relatively quickly, those at the back would have had a long wait - those at the front had mostly finished their refreshments before those at the back had received their food. I don't think I would have been happy sat down there. This is day one of the new 'express' CE service and the crew were certainly unfamiliar with the SOP. Once they get a few sectors under their belts I'm sure it will be as quick and efficient as it used to be on this sector. This notwithstanding, a very enjoyable flight. This is an early evening flight that falls within the 'Dinner' band. We drew the big straw on this sector as the aircraft was a mid-haul A321. There were 20 of the 23 seats occupied in the CE cabin. Actual flight time was just 30 minutes. Service on this flight was much swifter than the outbound, although no hot towels were offered. There were two crew members servicing the CE cabin and they were on their feet within 60 seconds of takeoff. The meals and drinks were served together seat-side from the trolley, and what a difference this made to the overall enjoyment of the service. With 23 fewer passengers than the morning sector, and only one less cabin crew member, the service was quicker and more relaxed than the morning. Both crews were very friendly and smiling, but the evening crew were certainly more relaxed. Option 1: Hot sandwich - (a ciabatta with pulled braised beef cheek, cheese and jalapeno peppers) and a dessert pot. Option 2: Fresh salad - and a dessert pot. As I had not eaten anything since noon, I wanted something a little more substantial and so I opted to try the sandwich. On the brunch service the sandwich was already plated in the galley, this time it was plated from the trolley by the seat. I was pleased to see the sandwich this time was actually cut in half, I was not so pleased to only be served one half! This was a 'dinner' service (albeit on a short 'express' sector) so I would have expected to have received the whole sandwich just as in the mid-morning brunch service. I don't know what the SOP is for this, but hopefully it will become clearer in the coming days and weeks. The sandwich itself was actually rather tasty, I am not really a sandwich lover but I did enjoy this. I would have enjoyed a whole sandwich more! I ordered champagne which again paired nicely with the sandwich. I know it is fashionable here to criticise the Castelnau but, when chilled properly at altitude, I find it really isn't too bad at all. I much prefer this to the Pommery and (especially) the Monopole that were previously served in CE. The dessert pot was nice and refreshing. My wife elected to have the 'fresh salad'. She really enjoyed it, again paired with the Castelnau. It's a quasi mezze plate, that was light and refreshing. The bread basket was offered to all customers and drink refills were offered to me and The Lady Tobias as the trolley returned to the galley. This truly is a great enhancement to the Manchester flights. It is a huge improvement to that we had become accustomed. My wife and I thoroughly enjoyed our first experiences of CE on this route. Yes, there were some issues in service but I suspect this will settle down once crews become familiar with the new routine. The MAN sector has always been a challenge for the cabin crew, and I don't see that changing anytime soon - especially if Club goes all the way back. 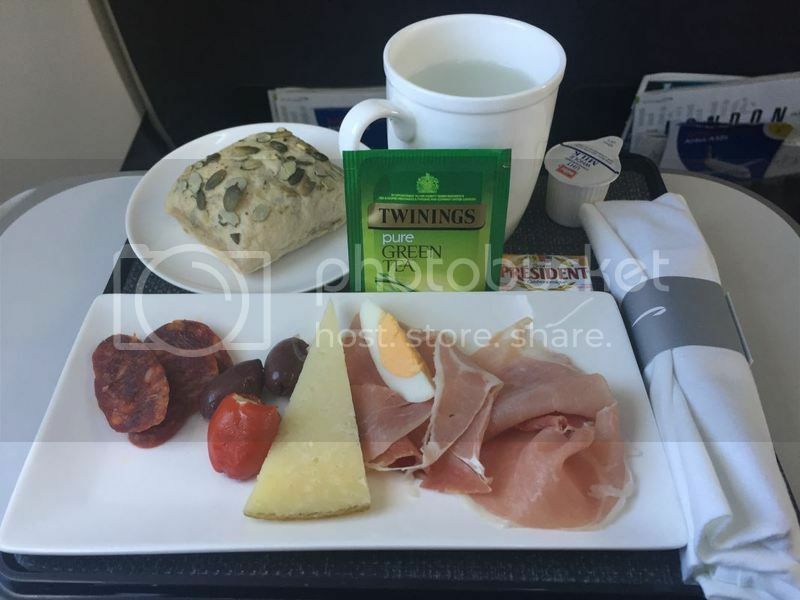 I cannot reconcile my experience yesterday to the complaints I've read in this topic about the sandwiches being disgusting or vile, the fact of the matter is the sandwiches were very popular on the two flights I took and I did not notice any half-eaten sandwiches being returned to the galley. Both cold options were just the right portion size and were really quite enjoyable, We see a true enhancement here and one that was much needed. The new service was very well received by those who commented on board. I have not yet flown any other Club Europe flights since the changes were introduced. Whilst the portions we were served on the two sectors flown to/from MAN might have been just right for those flights, or even for any old band one flight, I know that I would not be so impressed if that same offering was served to me on a 'Medium' band flight - especially so on lunch and dinner flights. I think BA needs to rethink its Medium band service. When I was told a while back of the changes to the CE service, those telling me were very excited about what they thought was coming. They were excited to be able to offer something they were not embarrassed to serve. Whilst there is certainly improvement to the Long and Short (especially domestic) bands, there is clearly a reduction in the offerings on Medium band flights. I would encourage everyone to feed back to BA after every Medium band flight to complain about the inadequacy of the revised food offering. As far as MAN is concerned - well done BA, it's about bloody time!